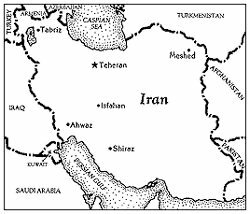 This is the Mahdavi Family who originally came from the town of Mashad, northeast of Tehran (see map below). Color foto, Tehran 1996, left to right sitting, Mohamad Reza (Mami) Mahdavi (Minou's younger brother), Maryam (Minou's younger sister), Grand Mom Iran Malek Mahdavi Mousheri (the matriarch of the family), standing Sohi, (Mami's wife and cousin), Minou, sister in law Toufan (Abby's wife) and Abby Mahdavi, Minou's younger brother. 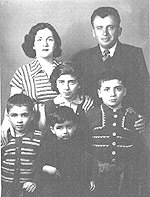 (Right, black & white foto, circa 1950, Grand Mom Iran Malek, Grand Dad Dr. Mahdavi, left to right Abby, Minou, Mami and upfront Maryam). A long time ago when Minou was still a little girl (before they sent her off to England to get her junior & senior high school education) Grand Dad Dr. Mahdavi had a premonition when he said to her: "How would you like to marry an Indonesian?" not knowing years later after he passed away that Minou would marry an Indonesian on her own. Must be a pre-arranged destiny as one enters life, as some people believe, the life program was already made up. A kind of "I want to enter such and such high school, at such an address and the teachers are so and so." Grand Dad Mahdavi must have felt this life program. There are 7 billion people on this earth, all of them dynamic. Surely, not all of them stick to same old stereotypes of life beliefs. Mami and Sohi who live in Dubai have a son, Ali, and daughter Yasi who got married recently in Dubai (when was that -- 2 years ago?) 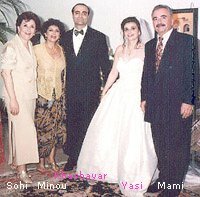 (Left foto, Sohi, Minou, the groom Khashayar, bride Yasi, and Mami. Right, Minou and the Matriarch when she visited Mom in Tehran 1997. She took Cyrus after so many years when he became a young man. His Dad sent him off to Tehran on his own so that Cyrus got acquainted where his other half came from, when Mom was about to leave Tehran. So, Mom stayed longer). (Far left, Mana and husband Paul Garden, an Englishman, who now live in Stanford, England). Mana has a cute little girl, named Tara, (left foto, and animation, Tara, Mana & Minou and Daddy Paul) whose accent is really English, Queen's English no less ... real cute. 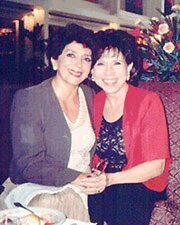 Dr. Heideh Harger, from Tehran, (below, right foto) a micro biologist, with 2 great little girls (well, they are good looking early twenties young women now) whose growing up lives since the ages of 3 and 5 were in Jakarta. Heideh is a friend, a friend in every sense of the word which anyone would love to have as a friend because she is a loyal friend -- come high or low waters -- and loyal friends are hard to come by. She once had a kindergarten for little tots in Jakarta, and thereafter became a teacher at the Jakarta International School (JIS) one of the leading high school for expatriates. Her husband Dr. Robin Harger from New Zealand was a United Nations guy up until August '98. He is no less than his wife. Doesn't talk much, but when he talks he says as it is -- hits the essence where it matters. Much like Adji does, doesn't beat about the bush, doesn't go for how's-the-weather rubbish. The Hargers stayed for some 13 (or was it 15) years in Jakarta. They loved it so much that every opportunity to extend their stay, they extended it. Many expatriates are like that. Some expatriates who have just arrived and does not know the place yet, may knock his surroundings, but after a little while (as soon as they realize this place is no copycat New York or London -- Jakarta's population during the day is 17 million; 10.5 million at night, and is some 800 square kilometers, according to city government officials -- and doesn't intend to be one because of its own charms both negative and positive), they love the place, the people and the variety of life styles. Then we have another close and a very old friend, Aska Kunze who is married to a German, Klaus Kunze. At one point in their lives there was a little mix-up about their nationalities. Aska is from Ambon and an Indonesian citizen. So one day some 40 odd years ago or thereabouts when she married Klaus, she took up his German citizenship, thinking to be one with her husband. But then good old Klaus took up and got his Indonesian citizenship. So here we have this bule (a white person) who speaks perfect Indonesian and for all intent and purposes when talking to Klaus on the phone for the first time think he is an indigenous Indonesian. Behold, when meeting him we have this bule European instead. To get back to the story, Aska--who by then became a German--ends up asking for a "stay permit" to stay in her own country each year while dear Klaus didn't need one anymore because Klaus decided that he wanted to stay here for good. Aska finally got her citizenship back after putting up with a few years of the hassles of getting it back. Aska is a friend who one can depend on to come up with something which one needs, all because she is a very thoughtful person. This something does not have to be something expensive or materially valuable in itself. It's like if one suddenly needs $1 and one doesn't have it because the banks are closed, dropped the $1 somewhere in the street or something like that, or transportation from point A to point B because one's own transportation has a flat tire, Aska can be depended to be thoughtful enough to come up with this help. Little things like these when one doesn't have it at that point in time, is something which in the minds of those being helped means a lot ... far more than the actual monetary or material value of that help. Helping people is what one associates Aska with. Must be her religion. One day Klaus' twin brother and a bunch of German sisters and cousins visited Jakarta a few years ago. He was an exact replica of the Indonesian Klaus. So, silly old Adji says to his replica, "How come you grew a beard so fast," in Indonesian ofcourse (because dear Klaus was clean shaven as always just a few days ago when they last met), and dear old replica mumbles something in German not understanding what the heck Adji was saying, observed by the whole Kunze family. Everybody had a good laugh at Adji's expense. Well, it was funny ... because here was Adji whacking Klaus in the back while replica was probably thinking who is this idiot whom he never met in his life whacking him in the back. And Klaus was like a little kid with his new toy when he first bought a brand new Mitsubishi Eterna, the car that Adji kept telling everybody was a fantastic car, dirt cheap to operate (8 to 9 kilometers per liter, the most important thing), easy to get spare parts (because of local assembly), stable at high 200 kmh speeds, and fast as hell. Unlike the same class 2,000 cc Honda passenger car which Adji is afraid to drive at speeds of over 150 kmh because of the unsure feeling of who is in control, the car or the driver. When Adji at first was raving about the Mitsubishi Eterna, Klaus, like most listeners kind of gave that "...yeah, yeah ... so what ..." kind of facial expression. Then one day, Klaus drives in with a spanking new Eterna, and proceeded to tell Adji "... I stepped on the gas, and you should see that guy in the other car ... vroom ... and he was left in the dust ... fantastic ... and cheap to run", and on and on, he went raving about his new toy. To which Adji told Klaus "I told you so ...". Then we have Nahid Houshmand former career diplomat at the Iranian Foreign Ministry who married businessman Manucher Houshmand who was President of a paint company in Indonesia when we met them and became friends. (Right foto Marcia Sabeti, an American and lady of an Iranian U.N. agency big shot, Minou standing, and Nahid -- must be writing a check or something). Nahid and Manucher (people sometimes call him with his adopted name 'Mark'. Kind of silly, when the Iranian name Manucher seems to be more dignified) have two great kids, the elder Afzadeh, a young woman of 18, and a handsome young man of 17 Arianwho is a sensitive person. He plays the guitar with feeling, according to Auntie Minou and, apparently, for a young man he has a grasp of life beyond his years. Must be his previous life experiences. Take his poems. One of them which he sent to Auntie Minou describes life below.